Disclosure: I received a sample DVD for review purposes. No other compensation was received and all opinions expressed are my own. Lincoln has been obsessed with trucks since he was old enough to push a vehicle toy around the floor, so it was no small wonder that he loves The Adventures of Chuck & Friends. This happy little dump truck has lots of heart and lots of friends - and they're well represented in our collection of vehicle toys. We were so excited to review the newest DVD release this spring - The Adventures of Chuck & Friends: Trucks Versus Wild! Since we don't subscribe to cable, we didn't know about this show before we saw it on DVD. The TV series can be found playing on The Hub TV Network in the U.S. and on Treehouse in Canada. Lincoln loves watching the show and playing with his Chuck and friends toys - sometimes I find them all parked in front of the TV like they are at a drive-in movie. Definitely funny. The characters are likeable and kids can easily identify with them, as they seem to have normal kid problems - even though they are vehicles! Chuck and his friends Digger, Handy, Rowdy, Biggs, Boomer, and Flip are always up for an adventure and are happy to take vehicle-loving kids along for the ride! Retail price is $12.97 and it is available at retail locations and online now! 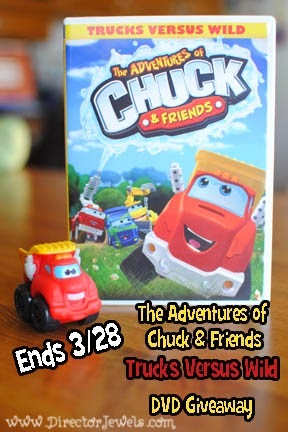 One Director Jewels reader will win The Adventures of Chuck & Friends: Trucks Versus Wild DVD! This giveaway will end on March 28 at 11:59pm CST. This giveaway is open to US readers only. Winner will be emailed and will have 48 hours to respond or prize will be forfeited. Disclosure: Thank you to SHOUT! Factory Kids for providing my sample DVD and the giveaway prize! I received no other compensation and all views expressed are my own. For more information, you can read my Giveaway Policy and my Disclosure Policy. i have watched the adventure of chuck and friends and my niece and i love it. My two little boys adore Chuck and Rowdy! We have several toys too! My boys love to watch The Adventures of Chuck & Friends. I don't recall watching this before but, my son loves anything with wheels!!! My four year old LOVES and my niece Love Chuck the Truck! We've never watched it before, but my son loves trucks - I'm sure he'd love the show too! I have never watched it myself but the kids have watched it. Yes, I have watched it with my son before. No we have not watched it but it sounds like it would be something they would enjoy. Yes! My kids love it. No. But we play with the toy cars ALL the time!! No we haven't but we have many Chuck & Friends toys. We have not watched this series yet. I have watched it with my son. We've never watched it, but I'm sure my kids would love to! We have never watched it but we have some of their toys. we have watch him on DVD. the kids love Chuck! I have never watched it, but I'm sure my little boy would love it! We've never watched it before, but my nephew loves trucks. my grand son loves Chuck and Friends! My kids and I watched Chuck once when we rented it from the library! They loves Chuck! No, but I think my son would love it! I had no idea they'd turned Chuck into a cartoon. My four year old has several Chuck and Friends vehicles. He would love this! It's a VERY CUTE SHOW! We are Fans.